China – two years too Late? Great fanfare was made of the recent visit to these shores of Chinese Vice-President Xi Jinping. 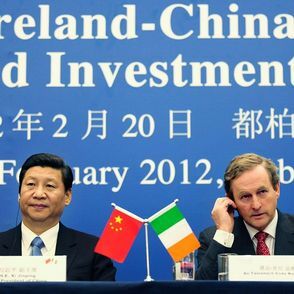 China has undoubtedly been the economic star of the twenty first century thus far, and Mr Jinping’s visit was no doubt arranged in the hope that he would sprinkle some much needed economic fairy dust over little ol’ Ireland, and in doing so resuscitate a comatose economy. However, with Ireland is in the throes of economic conflagration, what the country needs is not so much a sprinkling of fairy dust as a fleet of fire engines. Whilst any efforts to enhance ties with a world superpower should always be encouraged, surely the lines of communication with Beijing should have been opened much earlier – in November 2010 to be specific. That was the month Ireland effectively waved goodbye to its future by accepting the punitive and ruinous terms of the Troika bailout. At the time of the bailout, then Finance Minister Brian Lenihan insisted Ireland had no other option than to accept the Troika’s terms, extortionate interest rate and all. Mr Lenihan’s claims that Ireland had no leverage with which to negotiate more equitable terms rang hollow at the time and have since been proven to be outright hokum, both by eye-witnesses to the negotiationsandby the fact that only this week Greece is putting the finishing touches to a deal that will leave it’s own creditors sporting the type of haircut no bondholder ever finds fashionable. Why Ireland didn’t act similarly in November 2010 is unfathomable. With the future of the single currency on the line, clearly the Government had at least a few cards to play. Insisting on a fairer deal, lest the entire house of EU cards tumble, was one option open to the Government. Another was China. Once it became clear that Ireland would need outside assistance, the Government should, at the very least, have sounded out the Chinese about a possible loan. Whether the Government would have intended to go through with such an option would have been almost incidental. The effect of entering into negotiations with Beijing would have been to light a fire under Brussels, so unpalatable would the prospect of effectively conceding a share of EU territory to the Chinese have been to our European cousins. Would the Chinese have played ball? Without doubt. With the prospect of furthering their foreign interests to the point of wielding even a small degree of influence in EU matters (to go with their growing influence in African affairs (via mining activities) and US affairs (via large scale dollar acquisitions)), the Chinese would most likely have not only offered us a more favourable interest rate, but also a longer term over which to repay it. And from the Irish tax payers point of view, once the surrender of our economic sovereignty became inevitable did it really matter whether we became Mini-Beijing or Mini-Brussels? It’s not like the Cowen Government left us with any other options. If such a bold act of brinksmanship seems nuclear, we should remember these were – and, indeed, still are – nuclear economic times. The Cowen Government was faced with the option of upsetting our European friends or condemning their country to decades of hardship and austerity. They chose the latter. Had they acted in the Irish people’s best interests and played Beijing against Brussels we would surely, at the very least, have secured a far more reasonable counter offer from the Troika. Ultimately it was always in Ireland’s interests to remain in the single currency but this should not have been the only consideration when entering negotiations. We had bargaining chips to use but thanks to the timidity of Lenihan and Cowen – not to mention the dubious influence of the compromised Patrick Honohan, who found himself working for both the Irish Government and the ECB – what leverage we had was rendered about as effective as a papier-mâché crowbar. Of course, all of this is now academic. The ship of economic ruin was set on its course and the current coalition Government seem only too happy to keep it on the same path, even if the destination is the land of poverty and hardship. And anyone holding on to delusional hopes that at least lessons have been learned from the whole sorry mess need only look at the contrasting events of Iceland and Ireland of the past week. In Reykivich Geir Haarde, the Prime Minister who oversaw Iceland’s equally calamitous banking crash, began his trial for negligence, whilst our own sleeping watchman, Brian Cowen, received a standing ovation at the Fianna Fail Ard Fheis – a damning commentary on both our political and justice systems if ever there was one. So future Governments would be well advised to keep Beijing on speed dial, because with such a dysfunctional system of Governance it surely won’t be long until the next economic flames takes hold and maybe this time the call can be made to Far East Fire Brigade in time.